Cooking in life is a beautiful thing. Cooking in another country is an adventure. Cooking with a local in another country is truly an experience not to be missed. To know a person in their own country - in their own home - in their own kitchen, will open up a door into the heart and soul of where you are. You will step through into a world of color and depth and deliciousness like you have never experienced or tasted before. You will see everything in a different way, you will forever be changed and you may never want to travel the same way again. Antimo Cimino is the founder of the travel experience company VoomaGo. He dedicates his life to giving people beautiful life changing experiences all over the world. I was lucky enough to meet and become friends with Antimo long ago. He was my first Italian teacher. He was the one who taught me my first Italian words - mi chiamo and come stai - and how to roll my R's. He taught me how to make Zabaglione (an Italian custard dessert) and introduced me to Burrata(the best cheese you will ever eat). He helped my Mom and I in many ways with the opening of our coffee shop, and his hand painted open and close signs hung in our window from the first to the last day. He came to my mom's, sister's and my rescue when we found ourselves in southern Italy in a not so desirable place. One of his mother's vintage dresses hangs in my closet from a trip long ago where we harvested grapes and so so many more memories hang in my heart. Something only time can give. Recently we made new memories together doing a Limoncello making demonstration and Italian Culture night. We had always talked about working together and it was wonderful to finally do so...wonderful to reconnect, wonderful to catch up on our lives and to make plans and dreams for the future. In November 2014 my husband and I traveled to Italy together for the first time. I had been a few times and couldn't wait to show him my favorite place in the world. When we started making plans for our trip Antimo was the first one we wanted to talk to. He had recently launched his company VoomaGo and we couldn't wait to see what experiences were waiting to be had. We were going to be spending most of our time in Puglia in the heel of the Italian boot. Every VoomaGo experience was enticing and we wanted to do them all, but in the end we decided on a weekend experience in Lecce with Pasticiotto making (a little Italian baked pastry with custard filling) as well as a cooking experience in Manduria. Antimo also helped us with our itinerary which included Manduria, the hill town of Oria, the seaside town of Gallipoli, Lecce and others. He gave us some of the best towns to visit and the best order to visit them in so that we could make the most of our time. When we arrived in Manduria after a terrible gazillion hours of travel, Antimo had everything setup for us and our hosts at the beautiful B&B Santa Chiara were waiting...even though it was 3 in the morning (I said it was a terrible travel day). After a few hours of sleep we awoke to coffee and the most perfect Italian breakfast. We were immediately in heaven even though I'm sure we probably both looked like hell. After breakfast and a little wine tasting....because why not....we were ready to start our adventures. The next few days were filled with more wine tasting, gelato, exploring streets and towns, more gelato, walking on beaches, more perfect breakfasts and our first VoomaGo experience with locals making lunch. We were welcomed into Antonella's kitchen to cook lunch together as well as make a few special desserts. We were immediately at home and at ease as we got to work cooking and baking. I was so excited! We made a Cassata Siciliana which is a sponge cake with a sweet ricotta filling with candied fruits and chocolate chips. 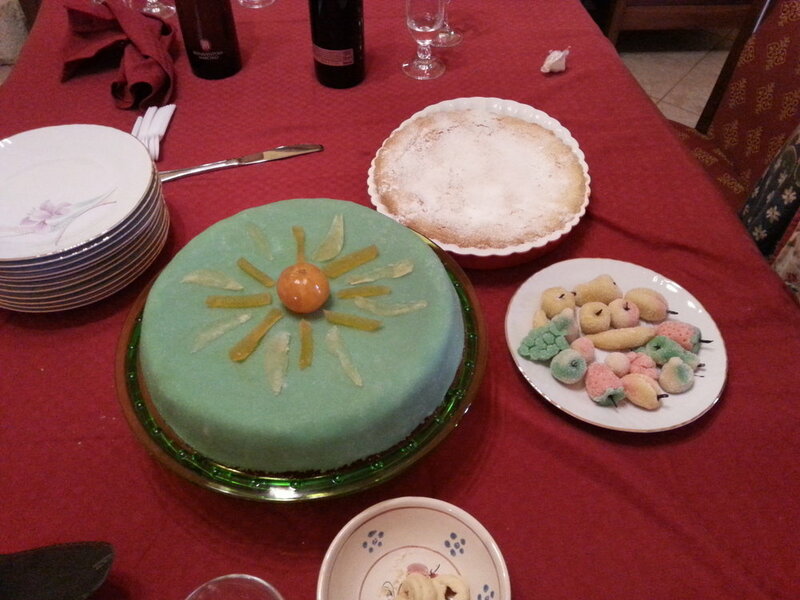 We also made marzipan from scratch to cover it, as well as marzipan fruits for decoration. This dessert was delightful to look at and to taste! I would have been happy if this was all we had made and eaten for the day but it was just the beginning. 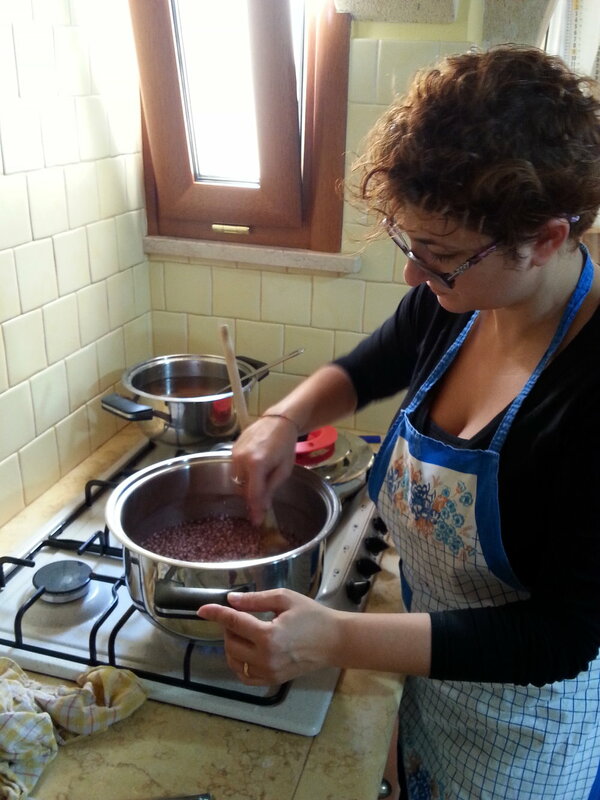 For the main dish we made risotto which used a generous amount of the famous Primitivo wine from the area. The red wine gave the risotto a magnificent color and a unique flavor, and being the wine lover that I am, I was very very happy to make and eat it :) For the rest of lunch we had a lovely spread of meats, grilled vegetables, and cheeses that were drizzled with a Primitivo wine reduction. It was almost like a delicious thick rich balsamic vinegar. The taste and how easy it was to make were a surprise and I really have no excuse for why I haven't made it a thousand times since then. After lunch was over and we couldn't take another bite we all went and sat in the living room and continued chatting. Just then they brought us in some persimmons....because we HAD to try them and why not eat a little more since we were already bursting at the seems. I'm happy that it was impossible to say no because it was worth getting a little fuller to try these colorful pudding like drops of happiness! They were the perfect sweet ending to our afternoon of amazing Italian memories. Our next VoomaGo experience was in Lecce where we met up with our local Gabriele with whom we quickly became friends. 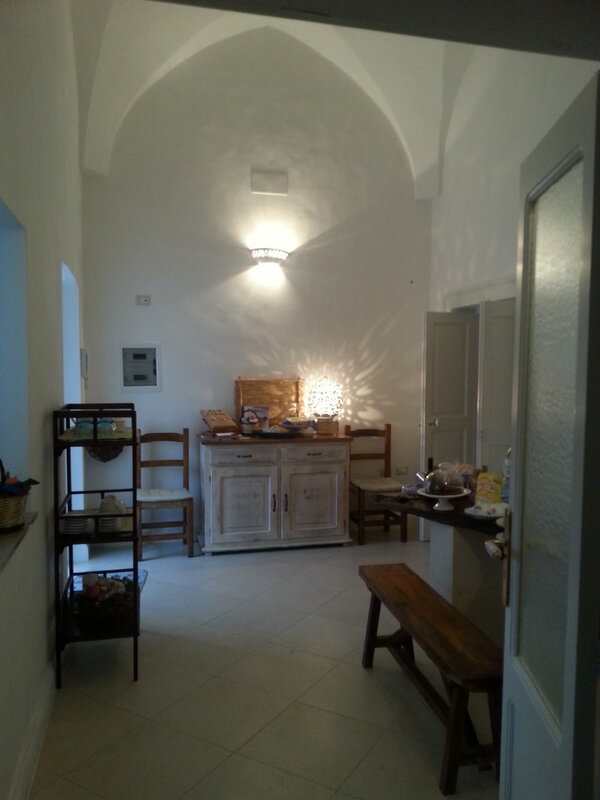 We stayed in an ancient stone home in the city center that was rustic and quirky and so beautifully Italian. It also had the best little courtyard....just to add that touch of perfection and jealousy. Ah this place! I don't even know how to describe the way it feels to be someplace like this. The stone walls and floors almost feel alive and bursting with history. If only they could talk and tell all that they have seen. It was such a magical setting to stay in and it started our weekend off perfectly. With our friend Gabriele as our private guide we walked the city discovering ancient ruins, back streets, churches and piazzas. We dined in off the beaten path restaurants which included a Pescheria(seafood market) where you chose from a selection of different types of fresh seafood and then they would prepare it too your liking. It was delectable and an unforgettable dining experience. One of the main parts of our Lecce weekend was cooking dinner together. In preparation for our evening we wine tasted and picked out something for dinner at a little out of the way shop with a wall of wines to choose from on tap. Taste, pick what you want and they fill a bottle to go....god I love Italians! The wines were incredible and the prices were ridiculous and I wished we could have bought enough for the rest of our trip AND for the next year of our lives. For the rest of the meal, we shopped at markets together as well as making our way to a butcher shop where the butcher proudly carried out a large piece of meat on his shoulder, presented it to us and asked which cut we would like. He then cut and sold us some beautiful steaks of cavallo (horse....yes, you heard me right and yes, we bought a back up option just in case). I was told that it is something that is eaten more in the south but my husband and I found it last time we were in Rome (yes...we bought some) so I'm actually not sure how far north you can buy it. I must say it's just not fair that it isn't available to buy in The States. Who knew that it was so rich and delicious. Even if it hadn't turned out to be one of the best steaks I have ever had, I would have still taken in the experience happily. 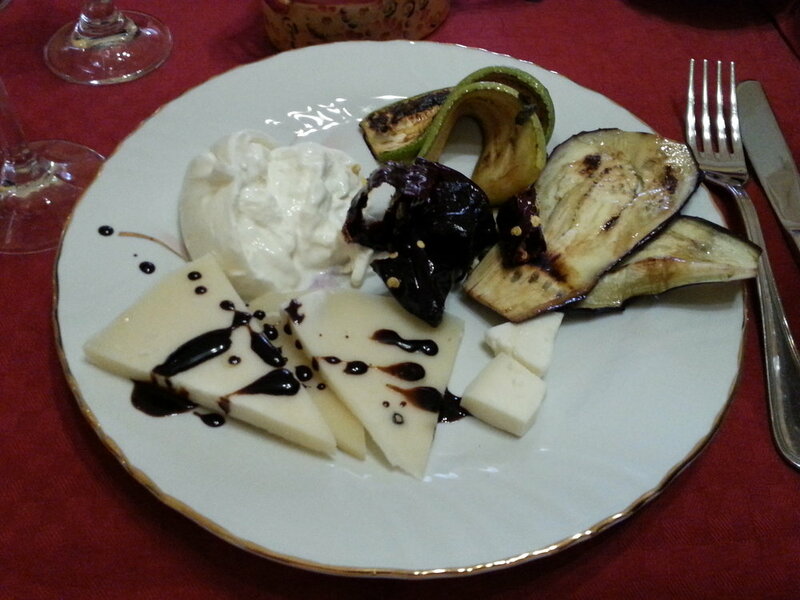 I have always loved trying new foods....especially in Italy where everything seems to be a little more divine! Breaking out of your norm and tasting something new can be an eye opening and hopefully tasty venture. It was a joy to cook this adventurous dinner, drink wine and dine together with Gabriele. We had so much fun laughing, learning about each other and our lives and learning about the food. The night was far from over though... after dinner it was time for our Pasticiotto making experience. Pasticiotto originates from Puglia. It is a baked pastry with a custard filling. I have only ever tried a vanilla filling but it can come with a chocolate filling too which sounds amazing. It is traditionally for breakfast but can be eaten anytime of the day. Luigi, our Pasticiotto making Italian arrived to share a family recipe with us and to show us how to make these lovely little sweet treats. Just hearing his name made me smile and I immediately thought of Luigi from Mario Brothers(sorry to all the Luigis out there, but that's the only time I had really heard the name). And really....if the Mario brother, instead of being a plummer, was a handsome Italian clothing shop owner with incredible hair, tight pants and his top shirt buttons undone.....they actually did look a little bit alike:) Anyway....Pasticiotto...back to the Pasticiotto. This has to have been one of the most unforgettable things I have ever done. So many dreams coming true at once. In this beautiful town in southern Italy, in an ancient stone home, with ambiance out of a movie, and locals that I felt I had known forever, we were being taught how to make this classic little pastry from an old family recipe....by Luigi.....ahhhhhh. My heart was singing, my soul was filling up with happiness and my mind was trying to capture every picture that came it's way. The weekend and the experiences were unforgettable and life changing and they left me contently wanting more! As we set off on our own to discover more of the south(I will write about that another time) we were overflowing with excitement for all of the experiences that we had just enjoyed. With a deeper fuller understanding of the country we were loving and the people we were meeting, we were ready to see new things, have more adventures and look at everything in a newer more beautiful way.